Schwarzwald-Stadion, originally called Dreisamstadion, opened on 4 September 1954. It was initially a very modest structure and it took until 1970 for the first major stand to be erected. Dreisamstadion got further expanded in 1980, which included the construction of a main stand and additional terraces. This resulted in a capacity of about 15,000. It got its current shape in the 1990s when all four stands got either rebuilt or renovated. The stadium changed names to Badenova-Stadion in 2004 as the result of a naming rights deal, and again in 2012 to MAGE SOLAR Stadion after a new deal was struck with sponsor Mage Solar. This deal ran out in 2014, after which the rights were purchased by the local tourism board who renamed it Schwarzwald-Stadion. 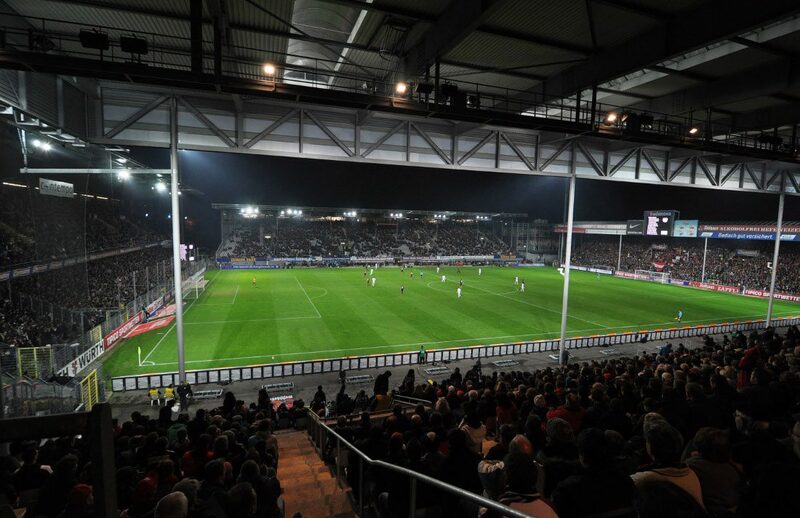 In the early 2010s, Freiburg started investigating whether to redevelop the Schwarzwald-Stadion or build a new stadium all together. They eventually settled on the second option and in 2015 chose a site in the north-west of Freiburg near the local airfield. The new stadium is expected to hold 35,000 spectators and come at a cost of €100 million. Freiburg hope to move into their new home at the start of the 2020-21 season. 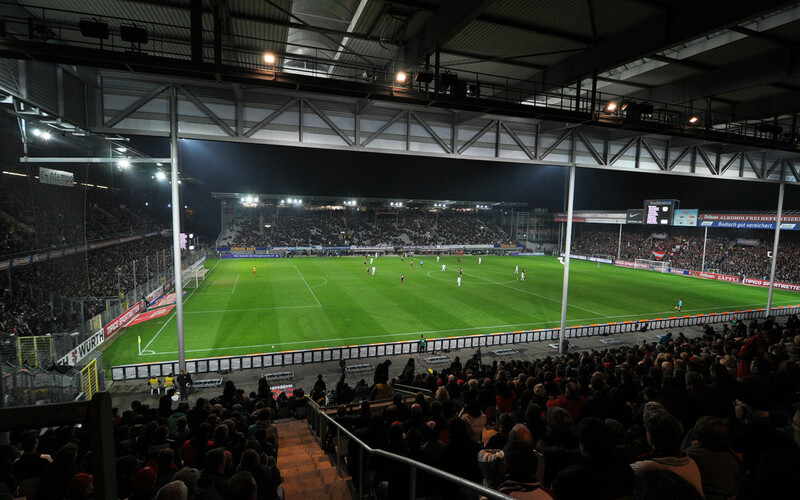 Schwarzwald-Stadion lies on the eastern edge of Freiburg, tucked against the hills of the Black Forest. The distance from Freiburg’s old town is about 3 kilometres and from the main railway station (Hauptbahnhof) almost 4.5 kilometres. If arriving by car from the A5 motorway, take exit Freiburg-Mitte. Follow the B31 east and the signs for Ebnet, Littenweiler and Stadien. Don’t take the B31 tunnel but keep left and turn onto the Schwarzwaldstraße, after which the stadium will show up on your left. From the main rail station or the old town one can take tram 1 to get to the stadium. Take the tram in the direction of Stadion or Littenweiler and get off at stop Römerhof. Schwarzwald-Stadion is located in a quiet residential neighbourhood, bordered by the river dreisam and further sports facilities. Eating and drinking is best done in Freiburg’s pleasant historic centre. There are a few options for those wanting to stay at close distance of Schwarzwald-Stadion: Gastehaus Ruh gets decent reviews and is a short walk away, Jugendherberge Freiburg is a cheap hostel, and FT Hotel is a third alternative at only a few minutes walking from the stadium. Otherwise, there are plenty of options in Freiburg’s city centre. Tickets for Freiburg games can be bought online, or at the SC-Ticketcenter at Schwarzwald-Stadion. Freiburg typically sell out about half of all their home matches, but tickets for most matches will be easily available if bought in advance. Tickets for the standing areas go for either €14.50 or €17.00, whereas a seat costs between €37.00 and €69.00. 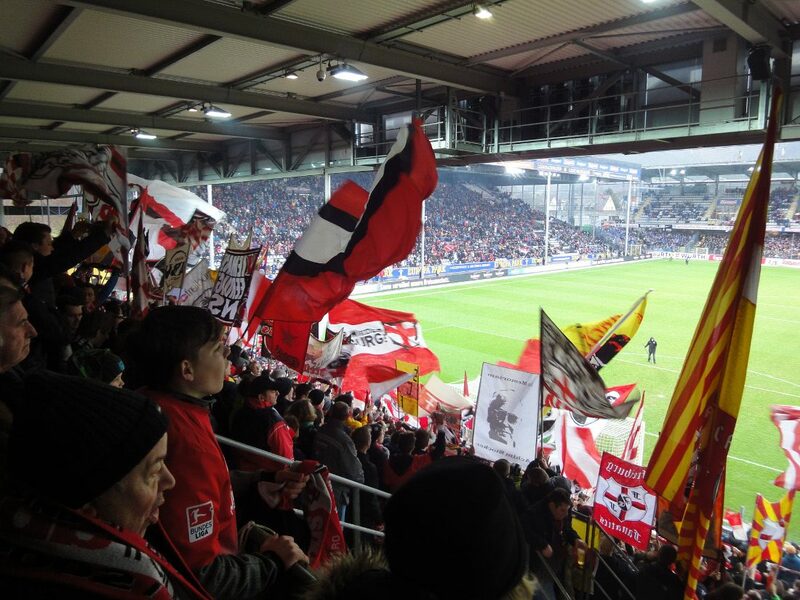 For more information email karten@scfreiburg.com. Scfreiburg.com – Official website of SC Freiburg. Freiburg.de – Freiburg tourist information. VAG-Freiburg.de – Freiburg public transport information.